I have been pretty good about not responding to liberal postings that represent egregiously-wrong facts with misplaced logic. I realize I'm a Princeton-Stanford math-science Ph.D. who has been doing quantitative science for one-third of a century and that I have given political matters a lot more thought than most of those posting cute-image, sound-byte Facebook memes. I also realize the stakes of wrong-headed political views can be catastrophic. Ideas have consequences. I have even been good about not responding to memes suggesting one candidate or the other should be rejected because of some lost emails or bad hair or stealing furniture from the White House or being brash or padding a self-paying charible trust with bribes. These are less important than what the party philosophies are and what candidates will do when elected. I've even been good about not responding to baldfaced lies about our economy or race relations getting better or the national debt getting smaller under the Democrats. I'm having trouble with is the association of American conservatives with Hitler and National Socialism and the Holocaust. Hitler was the focus of progressive-liberal-Democrat support in the United States as he rose to power. Pete Seeger sang and raised money for Hitler (not an anomoly as he did the same for Stalin and Ho Chi Minh) and he had a significant liberal following then and now. 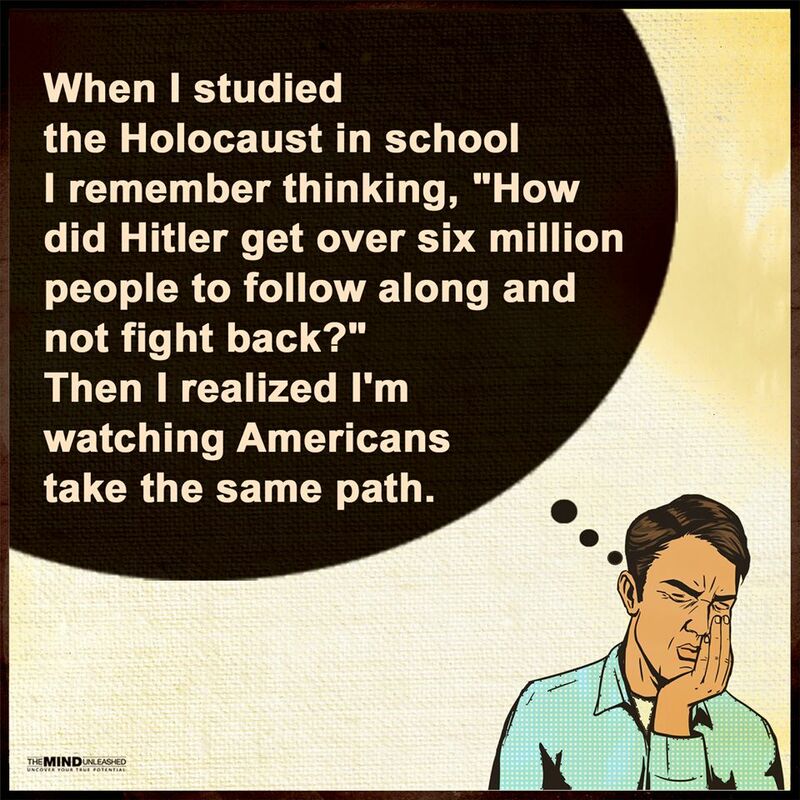 It was the conservative Republicans who stood up against National Socialism. This is the reality of the Nazi movement. Similarly, the so-called science of eugenics was a progressive-liberal-Democrat phenomenon. It goes back to President Wilson's support of Margaret Sanger and her organization, Planned Parenthood, and it goes forward to 1970. (They even made a "Star Trek" episode about it.) The liberal-accepted notion that racial extermination was a good thing for humanity as a whole was a frightening thing to the conservatives in the United States. This is the reality of the Holocaust. Going beyond the history lesson, methinks it reasonable to speculate why Hitler was a darling of the liberal left (along with Stalin, Mussolini, Castro, Mao, Mandella, and Arafat). Even the most-diehard progressives didn't admire the gulags and the gas chambers, but they supported the movements that created them. I believe the Nazi movement presented a serene image, a picture of hope and change, a strong, unified society that took care of all its members for the good of all. The Nazi message was one of joy and it offered the lonely a sense of belonging to something big and wonderful. Seven decades of hindsight have changed that view so even liberals reject Adolf Hitler today. Still, at that time, it was not a vision of evil and I understand why liberals, who generally don't see the big picture with historical perspective, would fall for it. They have believed in this vision for over a century, no matter how dire its consequences have been. It's the Democratic-Socialism vision of Bernie Sanders and, of course, the unifying vision of the Obama presidency and the Hillary campaign. So you're a liberal who supports Hillary. You yourself didn't support Hitler, but you support the values that supported Hitler. I understand why you are seduced by the dark side of politics. But I cannot condone using the Nazi movement, eugenics, and their terrible outcome as leverage against the very people who tried to stop it. It's a terrible, evil lie. America is going down the communism, socialism, collectivist path of Stalin and Hitler and Mao and the Democrats are leading the way. As today's liberals support the same values that went there before, I hold them accountable in some way for what happened back then. You don't have to agree with my interpretation of history, but at least understand why I see a special irony in the Republicans-as-Nazis images promoted by liberal Democrats today. If you sympathize with this essay, then here are my other American-issues essays. 19:58:45 Mountain Standard Time (MST). 705 visits to this web page.